So let’s discuss about Add-ons. This is Buy Me Cart Add-on. This is really helpful for your customers as Buy Me Cart will always sticky in your site and your customers will able to click on this Sticky Cart Icon and able to directly go to Cart page and Checkout page. 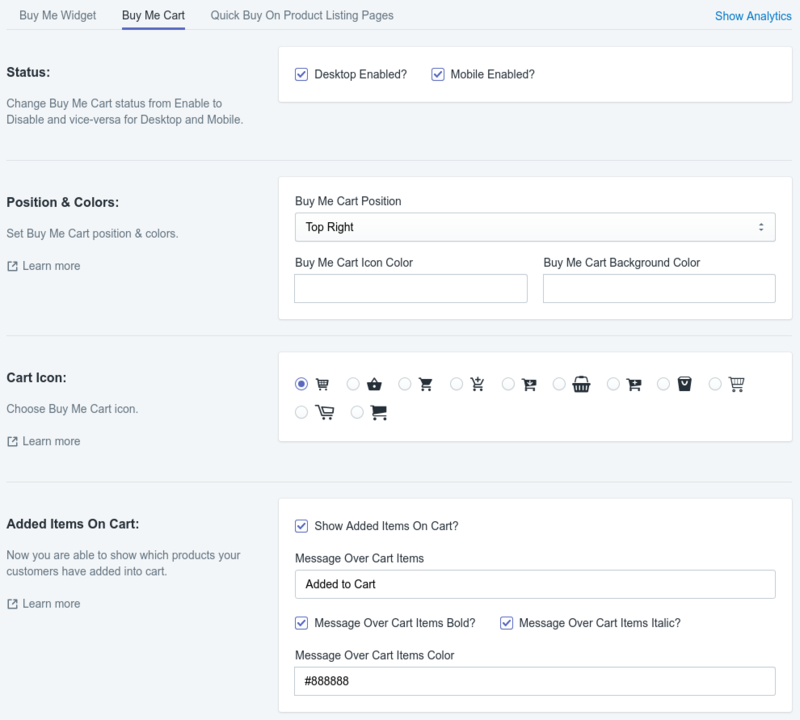 This will reduce your cart abandoned ratio and remind your customers for checkout and purchase products 🙂 Let’s discuss all options one by one. Desktop and Mobile Enable option: This is two switches for Desktop and Mobile enable for Buy Me Cart option only. So there are many cases where Merchant(store owner) want to display Buy Me Cart option in Desktop only or Mobile only. So just uncheck box where you don’t want to display Buy Me Cart Add-on. Buy Me Cart Position: You are able to choose where you want to display Buy Me Cart sticky Add-on in your store. There are four positions where you are able to display that includes Top Left, Top Right, Bottom Left and Bottom Right. Buy Me Cart Icon Color: You are able to choose which color you want for your Cart Icon. There will be Color Picker for that. Buy Me Cart Background Color: You are able to choose which color you want as Cart Background for your Buy Me Cart Icon. There will be Color Picker for that. Choose Cart Icon: We have list of Cart Icons from that you are able to choose whichever fit into your store Cart Icon. If you think we are missing any Cart icon please guide us and we will include that for you. Added Items On Cart: Now you are able to show recent added items to your customers as and when they will add items from Quick Buy Button On Product Listing from your site/store and by clicking on added products it will redirect them to cart page.